3 nights in Big Sky and 2 nights in Jackson Hole and lots of great fall activities including 2 wildlife tours in both Grand Teton and Yellowstone parks, admission to the Grizzy and Wolf Discovery Center, a scenic float through Grand Teton Park, and ziplining in Big Sky. Enjoy Big Sky country in the fall for reduced rates on lodging, fewer crowds, and fun outdoor activities. 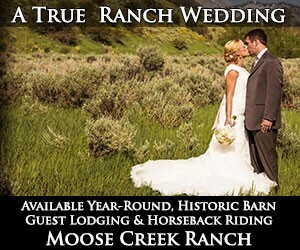 This package includes lodging at the Buck's T-4 Lodge in Big Sky, featuring a big western breakfast, oversized hot tubs and one of the best restaurants in Montana, as well as lodging at Teton Mountain Lodge in Teton Village near Jackson Hole, featuring a roof top hot tub and access to trails and mountains right outside your door. Yellowstone Evening Wildlife Tour: Enjoy a picnic dinner and the chance to see many types of wildlife in Yellowstone's Lamar Valley. 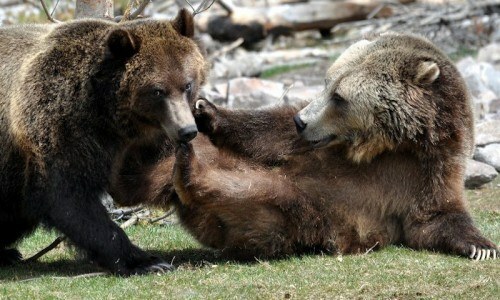 Grizzly and Wolf Discovery Center: This one of a kind wildlife center lets you get up close with wolves and bears. Ziplining in Big Sky: Fly across Gallatin River via zipline, a thrilling (and safe) endeavor you'll be talking about for years. Scenic Float Trip in Grand Teton National Park: Sit back and gaze up at the view as your knowledgeable guide shares all you'll ever want to know about the area's wildlife, history, and geology. Sunrise (or Sunset) Wildlife Tour in Grand Teton National Park: Sunrise and sunset are the best times to view wildlife in their natural habitat. Take your pick on the time of day. 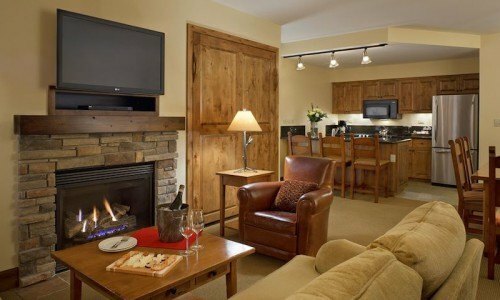 The Alpine Studio is furnished with a queen sized murphy bed, stone-face gas fireplace, fully-equipped state-of-the-art kitchen, dining area, flat screen tv, boot dryers, steam iron and board and wifi. It sleeps 2. Hotel amenities include an indoor and outdoor heated pool and hot tubs, fitness facilities, roof top hot tub, ski valet, on site restaurant, room service, and full service spa. 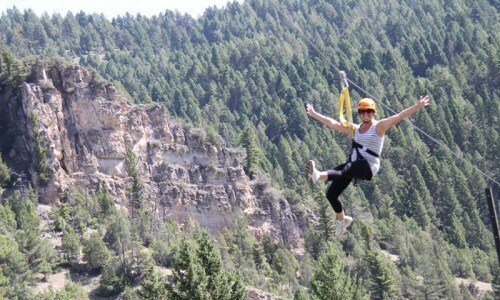 A fully guided zipline tour with 6 full zips and 4 sky bridges and 2 adventure bridges. Two of our zips cross the beautiful Gallatin River! Ziplining is a fun, exciting and eco-friendly way to experience the scenic beauty of the Greater Yellowstone Area in Montana. Discover Jackson Hole and Grand Teton National park during the best wildlife viewing hours of the day. Photograph that moose or the Tetons in superb light during dawn or dusk. On these four hour tours we will explore the animal hotspots that our professional guides know so well. We will put our comfortable four wheel drive vehicles to the test looking for wildlife on the un-marked dirt and paved roads through the area. Plan on uninterrupted observation followed by a wealth of information provided by our knowledgeable guides that have a passion for what they do here in Jackson Hole. Non strenuous hikes are included, if desired, to educate you about the smaller wonders of this special place and to open your senses to this glaciated landscape. 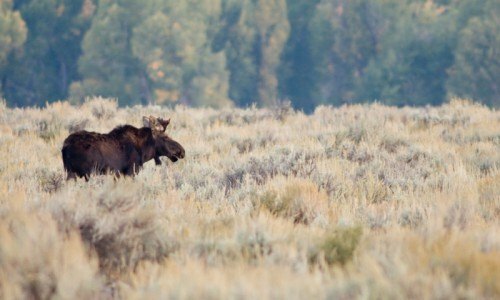 Animals abound here are observed during many of our guided eco-tours in Jackson Hole and Grand Teton National Park. We'll try to spot moose, elk, bison, pronghorn antelope, mule deer, wolves, black bears, grizzly bears, bald eagles, and trumpeter swans. Topics of conversation on our eco-tours include animal behavior, animal adaptations, geology of the area, and cultural history of this special place. The Grizzly & Wolf Discovery Center offers every visitor to Yellowstone a chance to uniquely experience the world of grizzly bears and gray wolves. All the animals at the Center are unable to survive in the wild and serve as ambassadors for their wild counterparts. 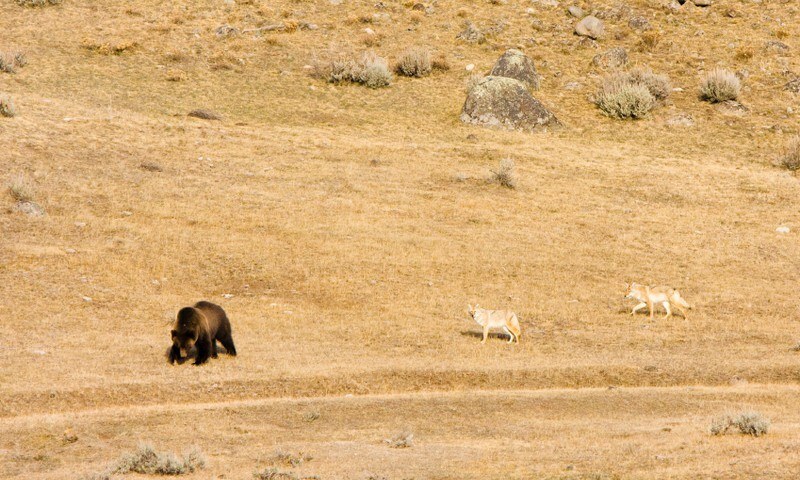 The center is home to grizzly bears from as far away as Alaska and as close as Yellowstone National Park. Each bear and its story are unique but they all have something in common; they came to reside here after becoming nuisance bears or orphaned cubs of a nuisance bear. These bears learn to obtain food from people, damage property in search of food or become aggressive toward people and are usually killed. Instead of being destroyed, the eight bears that reside at the center were rescued. The center provides the bears with a large outdoor habitat that includes many natural features including grass, logs, trees, talus fields, mulch digging areas, a waterfall and deep pond. Each bear is also provided with a private indoor area. Make sure to time your visit with the feeding hours, when keepers hide food within the habitat. Watch as the bears sniff out their food, dig it up and catch fish just like they did in the wild. The center is also home to eleven wolves that live in three different packs. The wolves were born in captivity and are unable to live in the wild. The facilities where they were born did not have room to keep them and the GWDC was able to provide them a home. Here, the wolves give visitors an up-close look at their normally secretive lives. The wolves eat, play, reinforce their dominance hierarchy and howl right in front of the viewing areas. 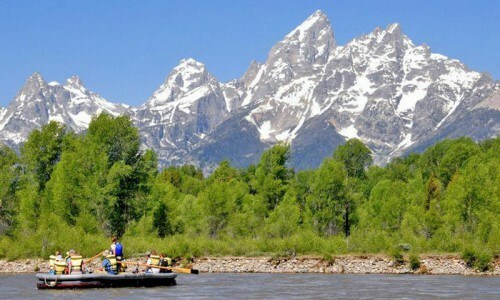 This scenic float trip along the Snake River is located entirely within Grand Teton National Park! As a small river company, Solitude Float Trips takes pride in their unhurried manner and ability to provide personal attention to every guest. Your guide will share tons of information about the park, wildlife, history, and geology. Make sure to ask questions too! Including round-trip transportation from Jackson, the trip takes about 3-4 hours. This tour begins mid-day and ends late to take advantage of the wildlife emerging to feed during the evening hours. 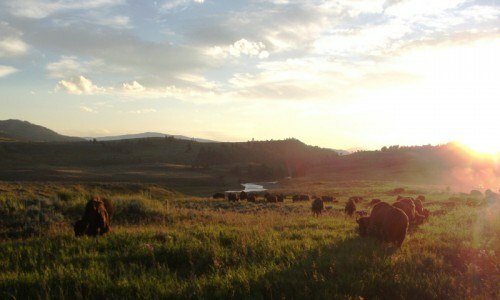 We pack a picnic and head to the northern reaches of Yellowstone. After a walk through of the Mammoth area we'll head towards our picnic area where we'll enjoy dinner (included). As the sun starts to set, our search for wildlife begins in earnest as we explore the Lamar Valley and beautiful Dunraven Pass. Keep the camera ready: elk, bison, moose, wolves and bear frequently make an appearance on this tour. 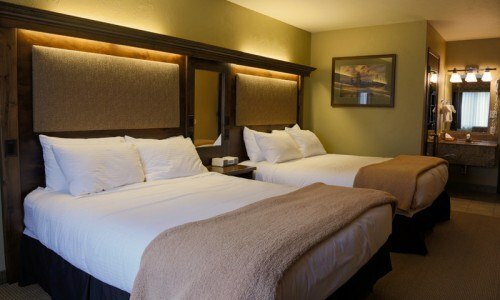 The deluxe rooms at Buck's T-4 have been recently remodeled and feature either a queen and sofa or 2 queen beds. 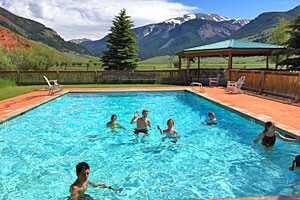 Located in the canyon near the Gallatin River, the lodge offers beautiful views and easy access (use the free bus route) to Big Sky Meadow Village and Big Sky Mountain. Amenities include a full hot breakfast, complimentary wifi, two oversized outdoor hot tubs, the historic bar and restaurant, and family game room.